Environmentally friendly water based protective coatings that are completely waterproof. These coatings can be used over water resistant canvas, fine art papers or signage vinyls. They are suitable for pigment, some dye and some solvent-based inks. Available in three finishes and usually applied with a turbine HVLP spray gun. GMS manufactures all its water based laminates in Australia. 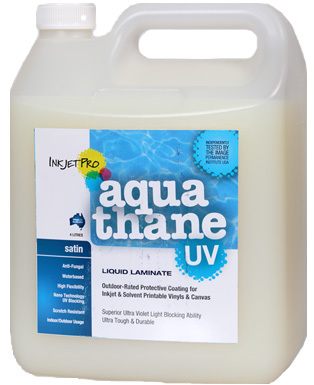 These products are made to Australian specifications in order to cater for our much harsher UV and heat levels. The water based laminates are designed primarily for true turbine based HVLP spray guns (available for purchase from Giclee Media Supplies) so they will give a perfectly level finish. They do not require any dilution of the product with distilled water before use. They are ready to go out of the bottle and do not clog up the spray gun at room temperatures. In addition to spray usage, rollers can be used with InkjetPro Gicleeshield II and Aquathane-UV Gloss only. All canvas products, aqueous or solvent should be top coated with a liquid laminate unless framed under glass or sealed with a heat laminate. There are no exceptions to this rule.